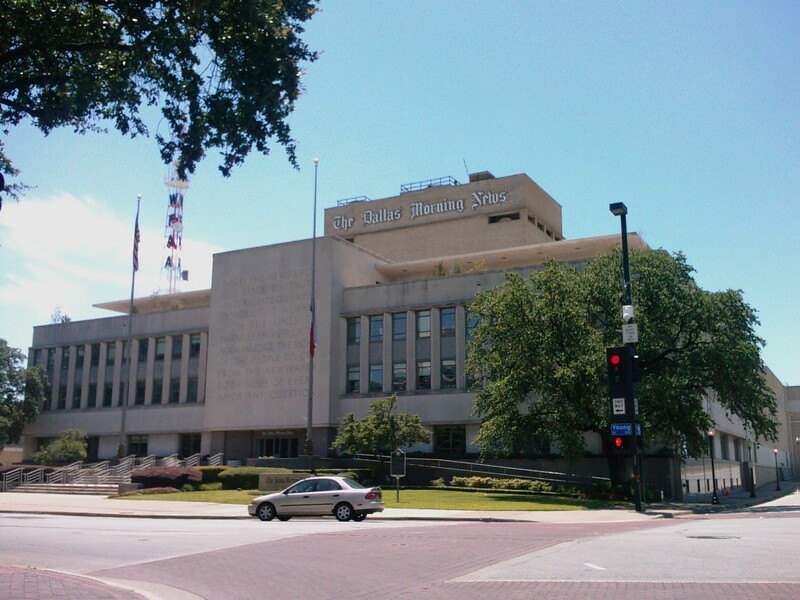 I swung by the Dallas Morning News building during my Sunday excursion and snapped this photo at a stop light. I, of course, parked and walked around. In less than an hour I will begin a new adventure as an online intern at the Dallas Morning News. That’s right — as of Saturday afternoon, I’m in Texas! After two stopovers at DFW in the past year, I finally have the chance to explore the state. I left from my parent’s house in Fort Lauderdale and drove the roughly 1,300 miles to Dallas, switching off with my uncle. Along the way we, stopped in Tallahassee and New Orleans. I’ve posted some photos on TwitPic along the way (the one above is an original for the blog). As I’ve mentioned before, this will be my fourth internship — the third at a daily. But this will be my first online internship and I’m very excited for the opportunity. What’s to come in the next 12 weeks? We shall see. Have a great first day, Greg! Good luck to you. The Dallas Morning News is lucky to have you on board! Good luck at the internship! Thanks, everyone! It’s going very well so far. I’m even more pumped now that I’m here. @Rick: Gah! I consciously tried to avoid that. At least we know the DMN won’t go under so long as Linchpen is in town. Keep us posted. Congratulations! Kick some serious arse over there Greg! Hey, that place looks familiar! :) Can’t wait to hear how it’s going. Could you enlighten me about your online internship program and what it entails? I am looking for an internship position ASAP. Otherwise, I will graduate in the fall of 2010 instead of spring of the same year. @Shakari: Mine wasn’t exactly a typical internship, like the one they mention in the brochure (that’s still a great internship). For more information, I’ve written more about the experience. In short, I had a lot of freedom and got to work on a lot of cool projects and with a lot of great people.